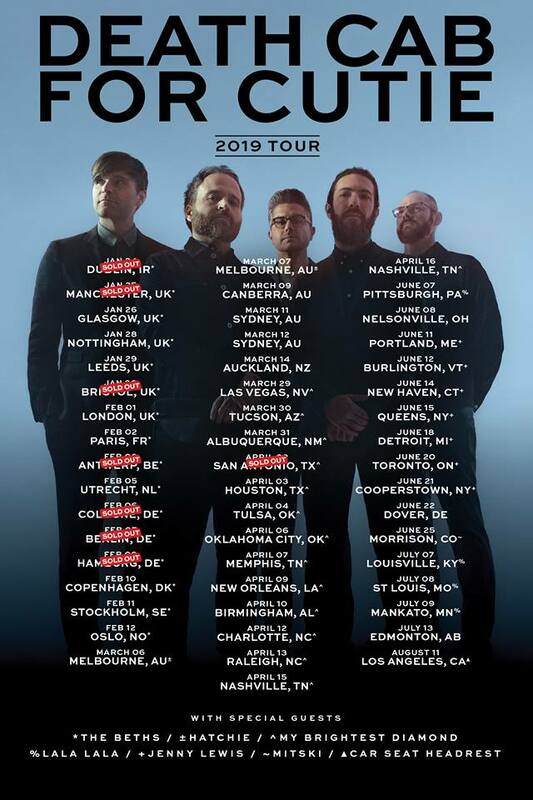 It still strikes me as a bit odd that Washington band Death Cab For Cutie's best-known song (at least on this side of the pond) is so remarkably dissimilar to pretty much all of the rest of their output. For whilst much of their stuff mines an, admittedly at times slightly unconventional, Indie/Alt/Post Rock seam, I Will Follow You Into the Dark is a sparse, brittle piece, with vocalist Ben Gibbard accompanying himself on acoustic guitar. And I am still not quite sure whether it is a suicide note or not. Stateside, the band are probably best known for their 2008 US hit I Will Possess Your Heart; this song boasting an equally unsettling lyric, but this time pinned down by a memorable hypnotic bass riff by Nick Harmer. Both Dark and Heart were performed this evening, and were each, along with the main set closer The Sound of Settling, highlights of a very enjoyable show. But much of the evening was devoted to the band's new album Thank You For Today, from which a total of seven songs were performed. 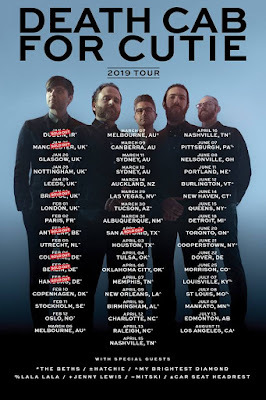 A sense of loss and wistful nostalgia pervades this collection I feel, perhaps consequent to band leader and main songwriter Gibbard recently hitting the Big 4-0. This being one of those points in life where, I would suggest, most of us indulge a bit of (occasionally wistful?) backward glancing. And whilst things start out rather well on the album, in my opinion, the opening five or so tracks set a level of quality the collection struggles to maintain. The opening two tunes both see Gibbard harking back to an old girlfriend – or possibly girlfriends. And whilst I Dreamt We Spoke is a dreamy 1980s influenced piece and a strong opener to the album; Summer Years undoubtedly represents the album's high-water mark. Imagine if you can Johnny Marr picking out a selection of his trademark arpeggios backed by the Low Life era New Order rhythm section, over which Neil Tennant languidly intones a tale of lost first love, and you are sort of most of the way there. That will never meet and it's just as well. It really is a fine, fine tune, and nothing else on the album even comes close. Thereafter things dribble downhill more than somewhat, I feel. There is nothing intrinsically wrong with any of the remaining tunes, but they really have nothing to say either musically or lyrically which had not already been said earlier in the collection. And whilst the Go-Betweens' sounding Near/Far is enjoyable enough, the overall impression I was left with from listening to the album was it was a product of a band treading water just a touch. The muse still dropping to say Hi from time to time, but only fleetingly.